In writing the “Run with the Wolves” saga I initially had a concept for a story about a number of different people who suffered from afflictions that were not of their choosing – and how differently those various people chose to deal with what fate had cruelly bestowed upon them. I had in mind a ‘Vampire-like’ character; a ‘Pack’ of both wolves and wolf-like humans who suffered from a lunar-sickness; and finally, a group of people who were rejected by society due to physical abnormalities or forced into hiding due to religious persecution. To make these characters come to life, it quickly became apparent to me that the setting was going to be every bit as important as the story itself. I did a lot of research – and a lot of soul-searching too, I suppose. The more I learned, the more I was drawn to the life and times of the 15th century in Medieval Europe, and in particular, to the year 1461. This was century of great discovery and learning. It was also a time of terrible repression and great cruelty. The 15th century saw the birth of great minds like Leonardo Da Vinci, Michelangelo, and Copernicus. The famous explorers Bartolomeu Dias, Christopher Columbus, John Cabot, and Vasco da Gamo opened up the world to new trade routes and lands not previously known to Europe. It was a century that saw the Johannes Gutenberg printed bible and the founding of universities in places such as Barcelona. The 15th century saw the birth of Joan of Arc in 1412, saw her lead the French forces against the English in 1428, and watched as she was burned at the stake in 1431. It saw the execution of the Czech religious reformer Jan Hus. It was the time of the War of the Roses, the Plagues that swept across Europe, the ongoing conflict between the three pillars of society – the Christian, Jewish, and Muslim faiths. It was a century that saw the expulsion of Jews from Portugal and Spain – and of course, the ‘Inquisition’ under Queen Isabella and King Ferdinand. And, it was the century that saw the advent of firearms and the change that development brought to warfare. If all that wasn’t enough, it was the time of Vlad the Impaler – the man said to have been the inspiration for Bram Stoker’s story ‘Dracula’. What better setting for my fantasy epic to take place in than this time period! 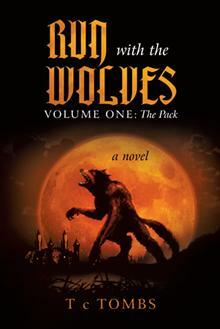 I hope you will check out my trilogy ‘Run with the Wolves’. Pick up a copy of Volume One ‘The Pack’ and see for yourself how history and fiction can be mixed to deliver a spell-binding tale that will keep you riveted and entertained. Please visit my website www.tctombs.com for retail sites, full reviews, storyboards, and special events. It is the fifteenth century, and three kingdoms are caught up in the dire conflicts of their time. As the possibility of a peaceful resolution provides hope that a decade-long war will finally end, no one realizes that dark forces are waiting to invoke chaos as a full moon rises. On a farm nestled beneath the Euralene Mountains along the western border of Medinia, young Willie works for the Smythes as a serf. One moonlit evening when the Smythes are gone to a neighbouring village, Willie hears the terrified cries of animals in the pastures. When he goes to investigate, he discovers that this wolf pack attack is like no other. Badly injured during the raid, he survives—but now he is afflicted by the full-moon madness that will soon transform him into one of the wolf creatures he dreads. With his life seemingly warped forever, Willie must face the prospect of a lifelong descent into horror. In a time of witchcraft, superstitious folk-lore, and fearsome creatures roaming the night, Willie struggles with an uncertain destiny and must seek help from the one man he holds most responsible for the dark fate that awaits him during the next full moon cycle. Beware of the full moon. This one is for all of the werewolf lovers! A well-written and addictive first novel. A well-developed, tightly plotted fantasy; readers will want installments two and three. T c Tombs earned degrees from Trent University and Wilfrid Laurier University in Canada. Like many Canadians, he loves hockey and golf, and he has a passion for medieval history, folk-lore, literature, film, and music. Terry and his wife, Sandra, live in the Greater Toronto Area in Ontario, Canada, where they have raised five daughters.